Reena can’t hear, but she notices every detail in everything around her. Brown Dog belongs to no one. He’s alone and lonely until Reena sees him in the park and they begin to play together. Reena notices he’s smart and quick. She also notices the children playing hide and seek and their happy smiles. Reena joins in their game. She looks for and discovers children hiding beneath butterfly bushes, up trees filled with cherry blossoms, within tall grasses, and behind tree trunks. When Reena hides, she can’t hear the children calling her. When she comes out, she is alone until her mother finds her. Brown Dog tags along. Reena and mum talk with their fingers. Reena feels left out of the group; different. So does Brown Dog. Reena returns to the park. She sees everyone in line for a turn on the flying fox. She sees the tree branch above Thomas’ head break. So does Brown Dog. Reena sees the quick Brown Dog leap into the air and fall on Thomas, who falls to the ground away from the branch. Reena and Brown Dog suit each other. Both can see the same things, but they are different. Can they become part of the group of different children playing together? 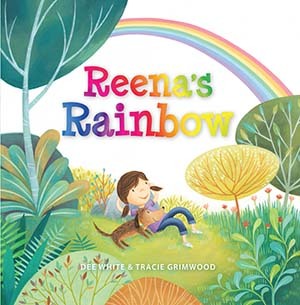 A delightful story; cleverly presented with important themes of friendship, diversity and acceptance. It’s built with great text, gorgeous illustrations, and valuable messages of inclusion and tolerance.